In the past, winners were rated solely by revenue. And while this is an important method of assessing a company’s value, it’s far from the only one. We believe that for the award to have real meaning, it should contain a number of different yardsticks. After all, just because a firm has the most revenue doesn’t make it the best. Our new criteria will be a more relevant indicator of quality as well as provide better marketing opportunities for winners. 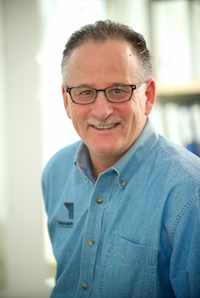 This year, Professional Remodeler honors nine remodelers as Market Leaders. Winners are awarded in one of five categories, and each category has a Western Regional Winner and an Eastern Regional Winner. Taken together, these companies are a powerful sampling of what makes the remodeling industry great. Monmouth Custom Builders is on the move. To boost its success, the company recently redesigned its management structure and now has three executives who each oversee a different division of the company: sales, major construction, and smaller construction/renovations. Monmouth does 30 to 40 jobs at one time with eight project managers. Most of its work has a smaller price tag, but the company does have four to five jobs at more than $1 million. Prior to the reorg, the next available project manager would get the next pending contract that came in, regardless of scope. A single project manager would do one job at a time and be in charge of meeting clients, pricing work orders, hiring subcontractors, setting schedules, and getting materials to the site. That meant PMs were responsible for everything, including smaller tasks such as running out to the hardware store. The newly created system involves a director of operations who oversees all of the project managers, each of whom has a field manager to help him. The company also created a purchasing department to oversee each project’s scope of work and to develop set pricing to be used with subcontractors. This frees up the PMs, who now receive a signed contract from trades and don’t have to worry about those items individually anymore. The new structure also gives project managers more ownership and more accountability. For example, using software developed in-house, PMs can immediately pay subcontractors, rather than having to go to the company owners for payment—though the owners do sign off on the transactions. These changes were made not a moment too soon since Monmouth is rapidly growing and now keeps two or three plumbers and electricians busy with full-time work. As the company takes on more new subcontractors, it needs a system to ensure that quality and pricing are up to par. To that end, Monmouth’s proprietary software now contains the company’s trade specs, which have been refined during its 20 years in business. For example, every contract involving heating and air includes the efficiency ratings, Btu capacity, type of ductwork, and so on that’s allowed by Monmouth. The system helps with revenue tracking as well. All payments are placed into categories—deposits, work order payments, warranties, etc., which provides insight into profit margins. The Levys’ business system also includes a program for keeping track of client selections and the building schedule. Clients get a recap every Friday that includes photographs and lets them know what was accomplished on their project that week and what’s to come. Most remodeling company owners shut their doors upon retirement. Entrepreneur Iris Harrell, who started her construction business with one employee in 1985, wanted to pass her legacy to the people who had helped her so smoothly run a profitable company. 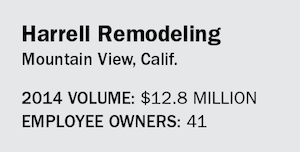 During a 14-year process, employees bought Harrell Remodeling through an employee stock ownership plan (ESOP). As of 2014, Harrell retired, and employees now own 100 percent of the company. Even with an evolving succession plan in place since 2001, there were many details to work out, and several consultants were hired to help. These professionals made sure that Harrell came up with the best possible plan that also met all legal requirements. One critical aspect was the empowerment and education of more than 40 employee owners. This was crucial in preparing them to operate the company on their own. Although everyone’s an owner at Harrell Remodeling, there’s still an org chart. Three core departments—design and sales, production, and administration—have separate leaders, but everyone offers input during quarterly and annual meetings. Recently the company launched a satellite showroom located on the far edge of its service area. 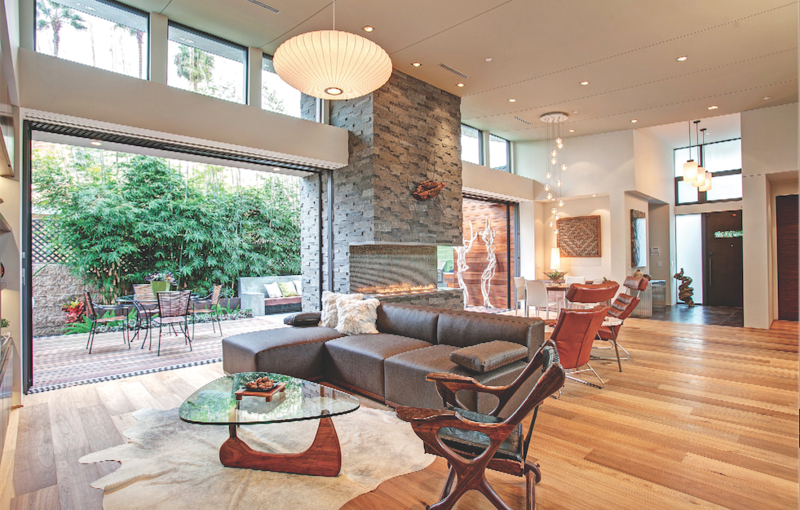 The 400-square-foot space on the main drag of Los Gatos sells product and helps the remodeling company make connections with the local community. The showroom is proving to be a success, increasing the company’s ability to market more effectively there and already bringing Harrell Remodeling more leads from the area. An employee stock ownership plan is the most tax-favored method of ownership transition. A company sets up a trust for company stock, which is funded by the company from tax-deductible pretax earnings. Company owners can defer taxation on gains by reinvesting in other securities; owners can sell all at once or in installments; and owners have the option to define their future role. The ESOP won’t work for every company and does best for those that have a profitable business with more than 15 employees. Educate so everyone understands the ESOP and how it will affect them at each point on their career path. Those retiring from the plan get a payout. Employees who are not culturally a good fit will often self-select out. By being exposed to financials, employee owners will understand tough business decisions such as layoffs or terminating paid holidays. Case Design/Remodeling takes advantage of technology at every level to help the company save time and money. Whether it’s looking at schedules for the field team, accepting mobile payments, processing orders for the handyman division, or utilizing design tools, the whole company is invested in digital solutions. Four years ago Case migrated all project management files into the cloud, a move that helped the company integrate systems across all of its locations. “We wanted people in different offices to see the most current version of a file,” says Karen Eckert, Case’s senior director of technology. She and other employees attend remodeling and technology conferences and talk with suppliers to keep up with what’s trending for businesses digitally. While the company will try new systems, it does so with caution. “We don’t want to be leading the charge and implement something that will not work and will disappear in a year,” Eckert says. Egnyte: a cloud-based file-sharing system. Project managers in the field can see the most current version of drawings on a smartphone or tablet at the same time as a designer in the office. “It’s like Dropbox on steroids,” Case senior director of technology Karen Eckert says. IBBY (Inspiration Built By You): Case’s online platform allows homeowners to design their own bathroom project from a selection of styles and materials. 20-20 Design, SketchUp, and Vectorworks: Used by designers to develop projects, which are then shared with clients as 3-D renderings displayed on large screens. Skype, FaceTime, GoToMeeting: “We’ve found that offering online meetings can make it easier for homeowners to carve out 30 to 60 minutes from their schedules to review project plans and even make material selections,” says marketing director Darryl Crosby. Microsoft Dynamics CRM: The Web-based system has customer and job-tracking information and can be accessed from anywhere. “Everyone has a log-in and there are dashboards so everyone can see in a snapshot how we’re doing,” Eckert says. Sage 300 Construction and Real Estate: Helps Case manage its many large-scale projects and connect with its accounting system. Sage also ties in with a third-party electronic time card app for field staff. For smaller projects in Case’s handyman division (called FRED), the company uses a PNC bank application similar to Square to accept mobile payments. There’s likely no way to compete without good technology at your fingertips if your business is smack in the middle of Silicon Valley. Like its sibling in the East, Case San Jose has support from the home office in terms of software and tools to get the business started. But it’s up to the owner to keep the business on the cutting edge. Jim Kabel is a big believer in automating tasks that the designers and carpenters do every day and having a system in which they can pass information seamlessly without having management get in the way as a broker. Technology is critical at every stage from generating Internet leads and tracking inquiries to presenting the company to homeowners (via tablets); estimating, designing, tracking and scheduling projects; forecasting sales; billing clients; paying invoices; tracking warranties; and more. Kabel knows he could be in business without technology, but the company couldn’t compete at its current volume without a much larger administrative staff. To that end, Case Design/Remodeling San Jose rolled out a cloud-based project management system in 2014. Now all design selections, subcontractor bids, project plans, photos, client information, and project schedules are available to all employees in any location. Every lead carpenter on the team has been trained in using the system and fully utilizes a “ruggedized” iPad to access this information on demand. The new system has improved the production team’s efficiency and reduced errors from using out-of-date plans in the field. It has also has helped ensure that the field team has accurate, up-to-date project information. Once a project is assigned, the lead carpenters have the ability to access the plans early and prepare for the project rather than waiting for the documentation or driving to the office to pick it up. Kabel has noticed an interesting phenomenon: spontaneous in-house training. Older construction employees teach the younger ones construction techniques, while the younger ones coach the older ones on technology. It’s a win-win. BuilderTrend: Construction management software. It solves the problem of version control and streamlines the selections process for the company’s many custom bathroom and kitchen projects. Red House: A proprietary customer relationship management (CRM) system. iPads: Field personnel use them for details on estimates, contracts, drawings, before photos, subcontractor bids and descriptions—everything that used to get crammed into a folder that often got left on the floor of a truck. Vectorworks, 20-20 Design, and SketchUp: Used by the designers for 2-D and 3-D renderings and cabinet design. Faceboook, LinkedIn, Google+, Pinterest, Houzz: Used by the marketing director for social media and to help clients and prospects connect. 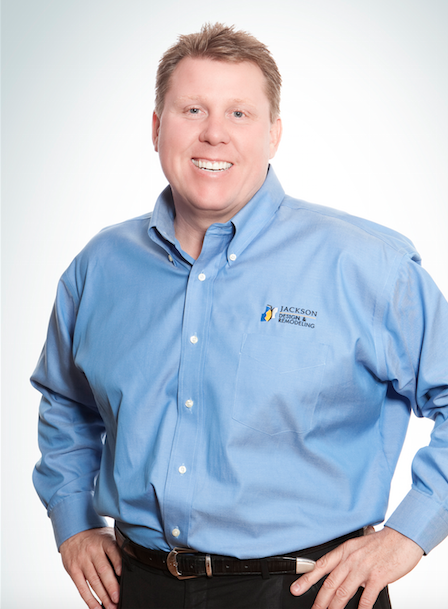 Although Winthorpe Design & Build has every modern system in place, Scott Szeliga can almost keep track of customers just by counting his many holiday greetings. Homeowners from 20 years ago are still sending Christmas cards and photos to the company that treats them like family. On a snowy winter day, Winthorpe’s crew could be shoveling an elderly client’s driveway, carrying in groceries for another client, or letting out the dogs for a third. The company’s design/build projects last anywhere from four months to, in one case, two years so the team gets pretty cozy with the homeowners. Getting to know clients’ likes and dislikes and their daily routines builds trust and makes the remodeling process as painless as possible. Relationship-building starts immediately with Szeliga listening more than talking during initial client meetings. There’s a lot of hand-holding, and Szeliga and his designer have the ability to gently steer clients in the right direction when it comes to aesthetics. During the project, there are weekly meetings at the client’s home or via Skype, and customers have access to the schedule online. Clients have relayed to Szeliga how easy it is to work with the company and how well the staff listened to them. Winthorpe raises clients’ confidence by being quick to acknowledge errors and attack them head on. Bad news is delivered without delay and clients are told the solution that’s forthcoming. Every job concludes with a two-page audit mailed to the client, who then has the opportunity to make comments on everything from Winthorpe’s actions on the first call to the design/build process and punch list. Six months later Winthorpe returns to make sure things have gone the way the client expected, and six months after that the company sends another survey. The response rate on Winthorpe’s customer satisfaction surveys is 100 percent. Winthorpe uses SolidBuilder design software by Digital Canal to give clients a vision of their projects. 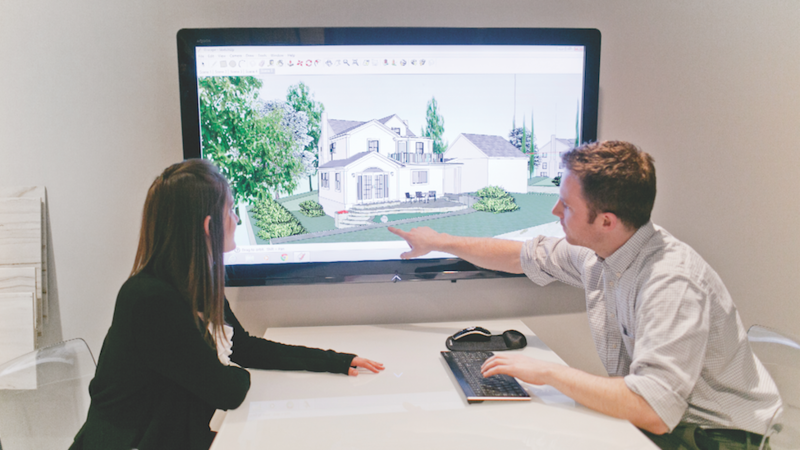 Customers come to the office and see their projects on the big screen; they can view 3-D renderings and walk through and look at the design from every angle. Clients have access to a hidden Pinterest board where they can store photos and share ideas with Winthorpe designers who also pin to the board. Referrals are a large part of Winthorpe’s business and kept the company solvent during the downturn. “We have great customer service” is touted so often by remodeling companies that the phrase can be rendered meaningless. Not so at HighCraft Builders. The remodeling company knows how to take care of its customers with a well-defined, structured process. 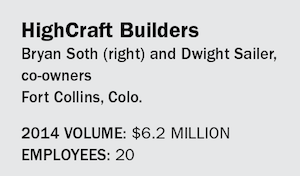 The owners of HighCraft believe that setting boundaries, educating clients in the company’s systems, and aligning customer expectations with budget builds trust. 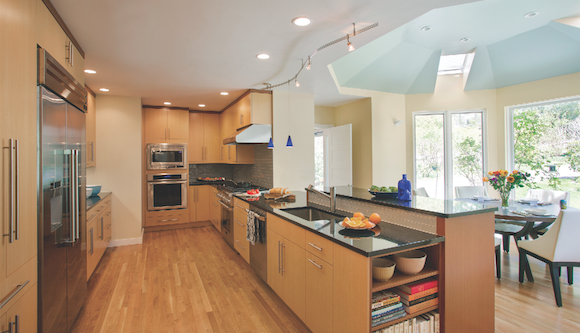 That trust, in turn, creates a space in which the remodeler can best serve the homeowner. HighCraft has a three-phase process for all projects: architectural design and due diligence, pre-construction, and construction. At each stage, clients have a single point of contact at the company—a close ally who looks out for their best interests. Clear communication is essential, and there’s no one-size-fits-all method. Whether it’s email, phone time, or face-to-face contact, HighCraft caters to the client’s preference throughout the project. The company has also created its own project management tool so that clients can see schedules, photographs, documentation, and financial information whenever they choose. To monitor how it’s doing, HighCraft uses GuildQuality’s Web-based customer satisfaction surveys, which, it says, almost always come back positive. The surveys provide a way for the remodeler to ensure that its sense of how well the job went aligns with the client’s. Any errors or flaws are immediately rectified or process improvements made. The company has stellar reviews online and has won the Houzz Customer Service award for four years in a row. 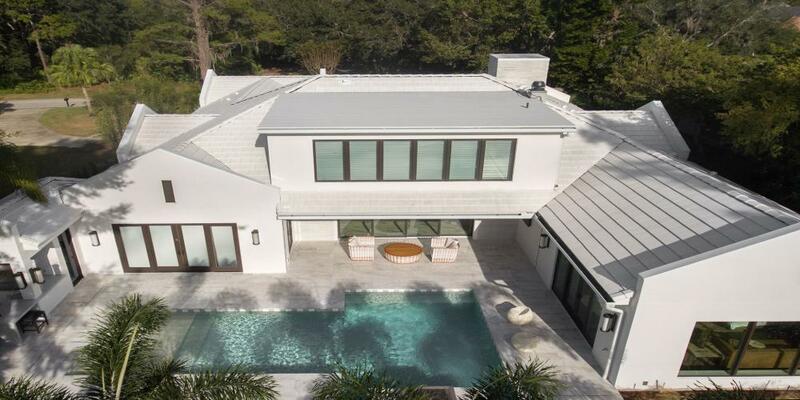 During that time, it has received only one rating lower than “5”on Houzz, and when it was discovered, one of HighCraft’s owners immediately called the client to resolve the issue. This year, HighCraft will be doing its own “mini Parade of Homes.” It has had success doing workshops and Q&As with clients and prospects and sees the home tours as yet another way to start people down the road to the perfect client experience. 1) Educate employees at every level to focus on customer satisfaction. 2) Ask clients the best way to stay in touch with them. Don’t assume everyone prefers email. 3) Make it easy for clients to play by your company’s rules, which will ensure a smooth process. 4) Establish a hand-off from one point of contact to the next after each stage. 5) Get customer feedback through surveys and act quickly on any discrepancies. “It’s not about the solution; it’s about finding out the problem.” That about sums up Peter Feinmann’s design philosophy. 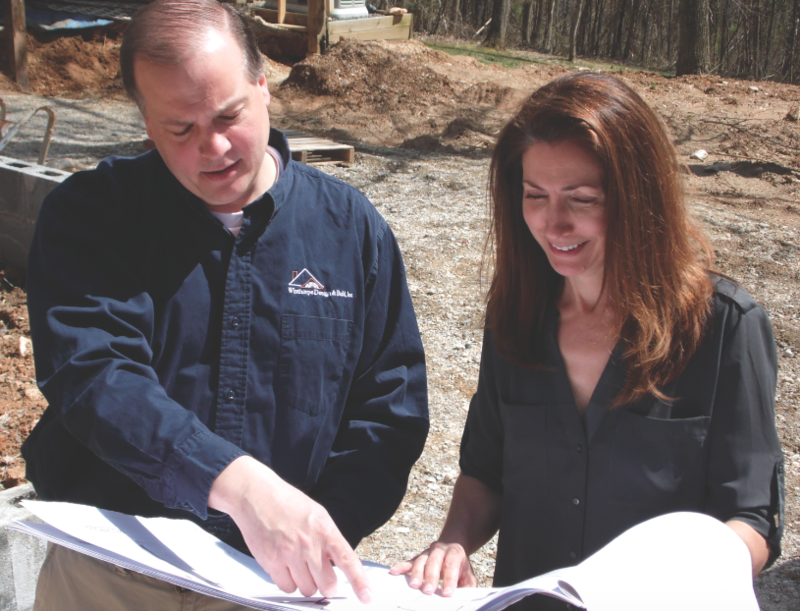 As owner of one of the oldest design/build firms in the greater Boston area, Feinmann pushes his company to fully embody the design/build method—as opposed to the “build-design” concept he sees many others attempting. 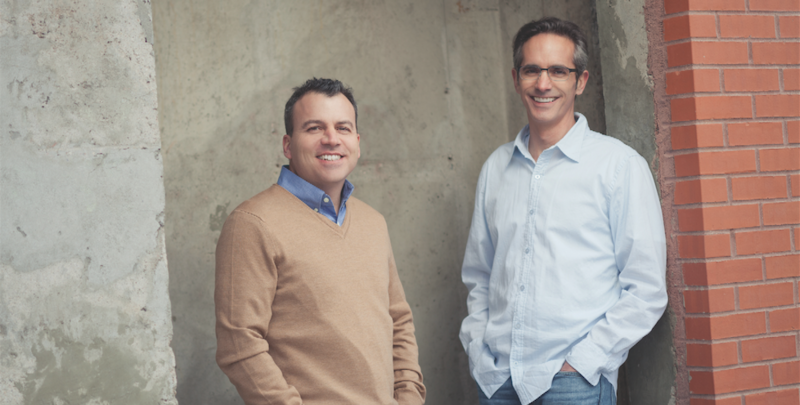 Design is at the top of Feinmann Inc.’s decision-making process, and everything flows from there. Clients come to the company specifically because of its outstanding aesthetics. 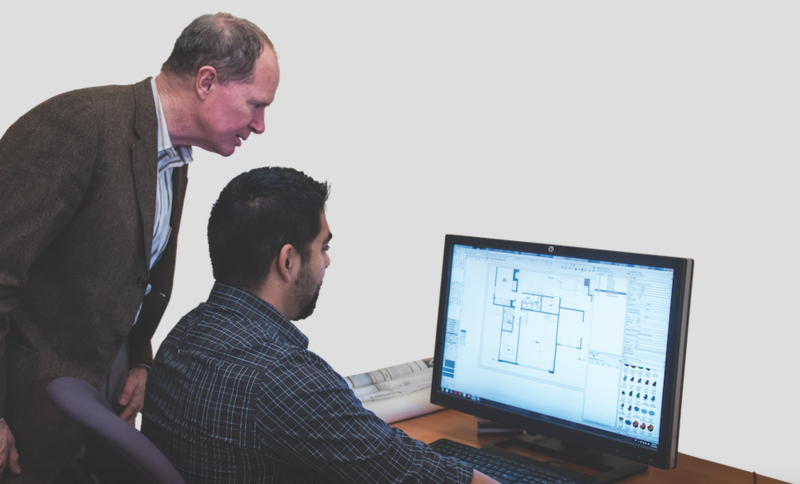 The importance of design carries through to the company’s staffing: Since 1999, there have been two architects on staff; there are now also two kitchen designers; and several project managers have design backgrounds. 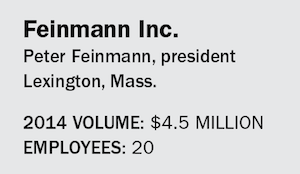 Even more important than the skills that employees bring to the company when they start working there is what happens during their tenure with Feinmann. Talent is nurtured and developed, and new hires are mentored and guided to find their particular strengths. Architects don’t work in isolation, project managers collaborate, everyone looks at design’s impact on the project’s budget, and Feinmann visualizes space and works closely with the staff as well. The company is inherently client-centered. Everyone involved in a project is concerned with what the clients want and how best to deliver it. Feinmann has noticed that customers often come to the remodeling process all ready with solutions in mind. He believes that it’s his company’s job to dig deeper to unearth the real problem that’s driving the desire to remodel. For example, one client came to Feinmann saying that she wanted to hire him to take down the dining room wall. After a series of conversations, Feinmann discovered that the real problem was lack of open space, and the team was able to create an open floor plan to satisfy the client. Let designers focus on design. Hire a separate staff for sales. The buck stops with the project manager. It’s strategic to find the problem first, then probe for solutions, and then qualify that with the budget. When more than two dozen of your 46 employees are designers, it’s easy for clients to see the main focus of your business. 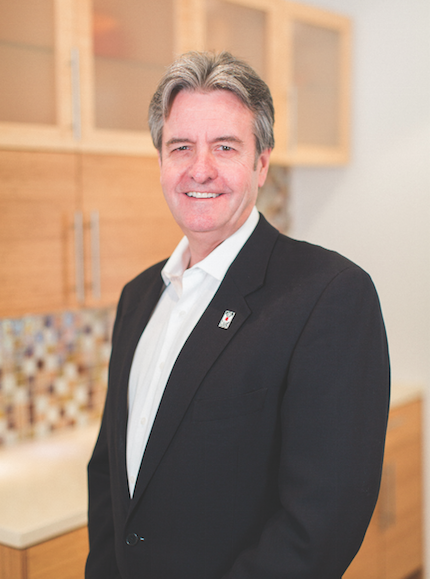 Over the past 26 years, Jackson Design & Remodeling has built a staff of designers with an impressive alphabet soup of licenses and certifications from AIA to CAPS, LEED, CGP, CKD, AKBD, and Allied ASID. When hiring, the company looks for what it calls “rock stars” who are not only phenomenal designers, but who are organized and systematic in their approach, know how to work with clients, and are accountable. Designers undergo a rigorous interview process with eight to 10 people, and once hired, work closely with senior staff to fully understand JDR’s design philosophy and company culture. Collaboration is the key. Every employee brings his or her talent to the table to help clients find a solution that works with their style and budget. Established systems help JDR limit change orders to just 5 percent of revenue, which is nearly unheard of in the industry. The company only designs for what it builds, and the team puts together thorough scopes of work that can reach more than 50 pages. An offsite designer develops beautiful renderings that look like photographs, showing clients their design as realistically as possible. Using custom software that the team says has been “given steroids and additional protein bars,” the mystery of any project is dispelled with a dashboard that’s sent to clients every Friday between noon and 2 p.m. It shows them when their project starts and ends, if there are any delays, and what to expect the following week. 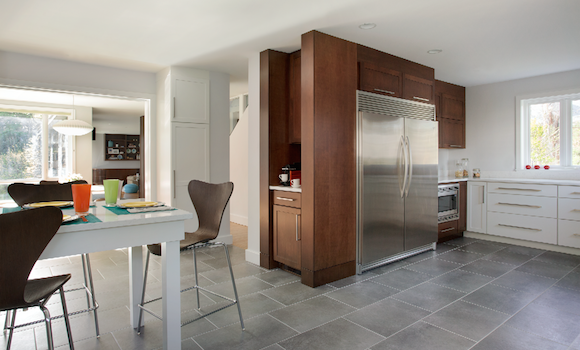 Jackson Design & Remodeling doesn’t impose design solutions on its customers. Its design philosophy is all about having a clear understanding of what clients want. 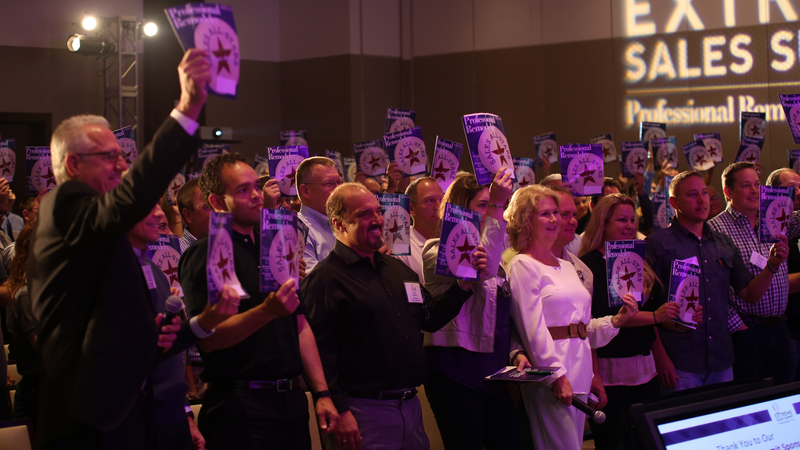 Education includes visits for much of the staff to events such as the Kitchen & Bath Industry Show and the Las Vegas Market Furniture Show to keep up on trends and new procedures, as well as in-office lunch-and-learn sessions and product knowledge seminars held 26 to 32 times a year. Assistant designers are paired with various senior designers for a time to get well-rounded training. JDR believes in promoting from within. Michael McCutcheon walks the walk when it comes to sustainability. A lifelong “green and healthy” advocate, he was a founding member of Build It Green, a nonprofit that works with building professionals, legislators, and homeowners to increase awareness of green practices in California. He also helped to develop Build It Green’s Certified Green Building Professional training curriculum. The company itself is run to be as green and sustainable as possible. Staff are mindful of opportunities to support the environment, whether by using sustainable materials, preventing pollution, conserving water and power, or creating a healthy environment by minimizing toxins and optimizing indoor air quality. All of McCutcheon’s key production staff are Certified Green Building Professionals. This ensures that clients will benefit not only from the company’s philosophy of sustainability but also from the staff’s knowledge of industry best practices. The company also has a green purchasing policy, installs Energy Star appliances and equipment, uses recycled materials whenever possible, and buys nontoxic products. 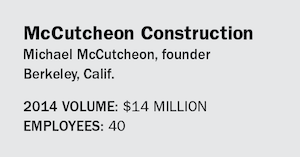 In 2011, the East Bay Municipal Utility District suspected that McCutcheon Construction had a broken water meter because the company was using 80 percent less water than an average office of the same size. 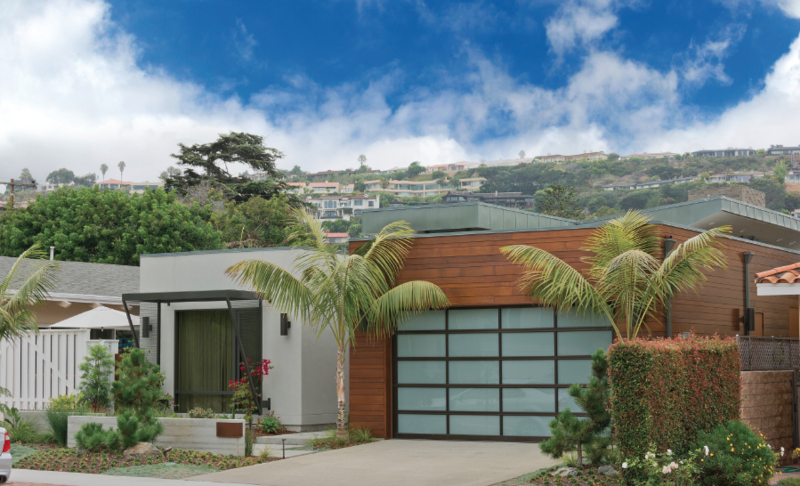 But the meter was working just fine, and EBMUD publicly recognized McCutcheon Construction for its outstanding water efficiency, achieved through high-efficiency plumbing fixtures, drought tolerant landscaping, and a culture of consciousness for all water use. The company’s photovoltaic system often supplies all the power needed for the office, and facilities are run at a net-zero energy consumption rate. The same principles apply for projects and jobsites. Practices include compliance with the Green Halo waste diversion and recycling tracking system to ensure optimal salvage of materials, and selecting products that are energy efficient, no-VOC, recyclable, and/or sustainably sourced. The staff bring these ideals to every phase of a project, often at no extra cost to clients. To communicate these sustainable ideals, McCutcheon engages clients in ways that they can understand. Most homeowners aren’t drawn to his company because of its sustainable building practices; they’re motivated by the desire for an energy-efficient home that will save them money. And though they understand little about indoor air quality, they know they want a healthy, comfortable house. McCutcheon spends time educating clients to understand the benefits of remodeling to last another 50 years for their family and families beyond theirs. That, to him, is sustainability. Participating in the above-ground economy. Recycling and renovating buildings and making use of what’s already there rather than ripping them down and disposing of them. to make cheap wood products. Ensuring that people have a good quality of life. Not being arrogant about humans’ place in the world. We are no more evolved than an ant; we’re equally adapted to our niche. Building well-designed, high-quality structures that are useful, aesthetically pleasing, and long-lasting.